What are additional compound properties files and how do I use them? Progenesis MetaScope provides the ability to augment SDF or CSV compound databases with so-called Additional compound properties files. These allow you to separate out properties provided in externally sourced databases (e.g. neutral mass and structure), from those produced in-house (e.g. retention time and CCS), thereby allowing you to update the externally sourced part without losing these additional properties. What is an additional compound properties file? Why use an additional compound properties file? How do I use an additional compound properties file? How do I create my own additional compound properties file? How do I append to an existing additional compound properties file? Adduct The adduct form that this row refers to. The format of this field is like in these examples: "M+H", "M-NH4"
An additional compound properties file allows you to store retention time and CCS values separately from your main SDF or CSV database file. Using an additional compound properties file, you separate those properties of a compound which are intrinsic and constant for everyone, from those that are specific to your experimental method/machine etc. Thus, you can still share your main SDF database, without mixing in properties that are likely to be different for other researchers. If you obtain an SDF file from an external source (e.g. 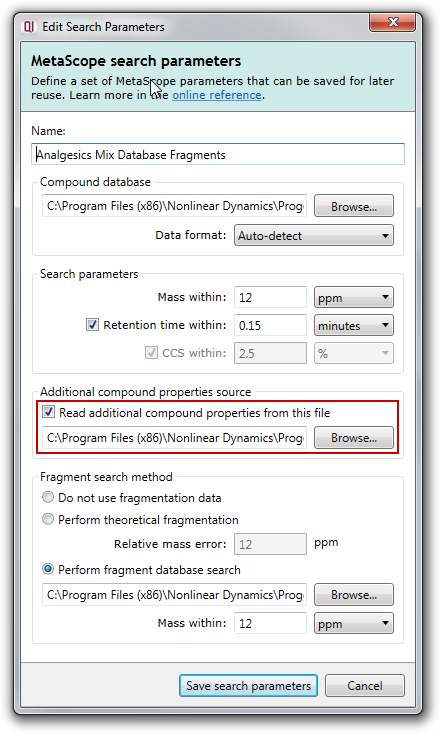 ChemSpider), and later wish to update this SDF file to a newer version provided by ChemSpider, the use of an additional compound properties file means you won't have to re-enter all your RT and CCS values in the updated SDF. Different adducted forms of a compound may have different CCS values, and storing this in an SDF file (which only concerns the neutral compound) is problematic. By using an additional compound properties file, it becomes easy to record the different adduct values. Note that the CCS within option is disabled in the screenshot above. 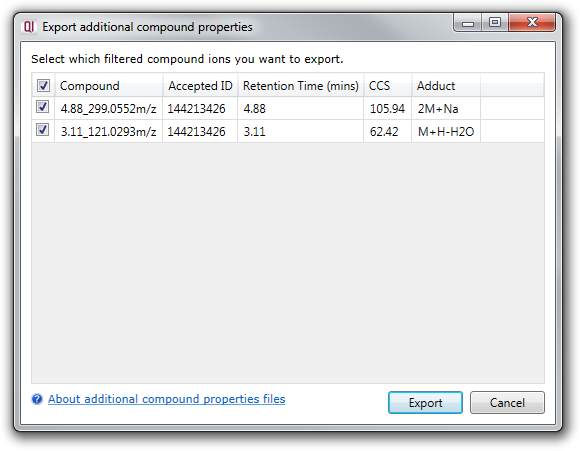 Progenesis QI will detect whether your experiment contains CCS data, and only enable this option if it does. For every compound present in the SDF or CSV database, Progenesis QI will look in the additional compound properties file for a row with a matching compound ID (or multiple rows for multiple adducts). If a matching row is found, the retention time and CCS values therein will be compared to your experimental measured values. The retention time and CCS values read from the additional compound properties file will be displayed in the Possible identifications area, along with the difference between the measured values. 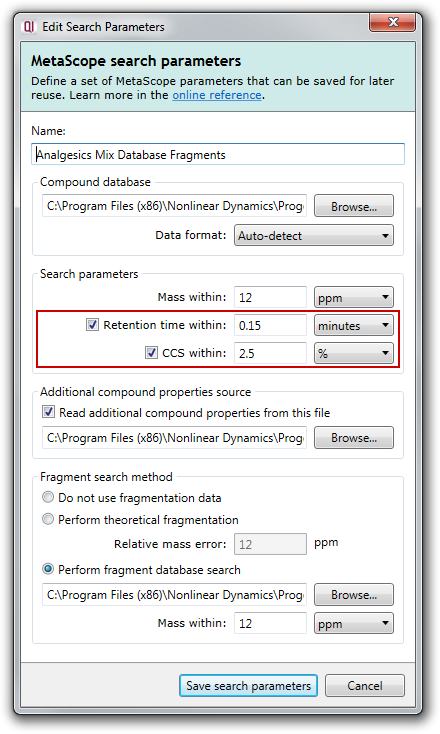 To create an additional compound properties file using measured retention times and CCS values, first follow the normal identification workflow. Clicking the Export button will prompt you to choose a filename, then carry out the export for you. You can now use the generated file to assist searches in future experiments. Simply browse to the generated CSV file in the Additional compound properties source section of the MetaScope search parameters dialog (see above). Suppose you have already generated your additional compound properties file using the above method, but you wish to extend it by adding new data from a recent experiment. This is easy to do in Progenesis QI. 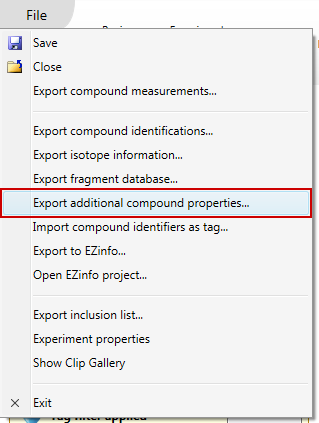 When exporting the additional compound properties file, choose the existing CSV file when prompted for a filename. To append your new data, choose Append, and the new data will be added to the end of your additional compound properties file. Warning: Choosing Overwrite in the above dialog will completely overwrite the existing file. Make sure this is what you intend to do before choosing this option, and we recommend making a backup of the file just in case you need it again.